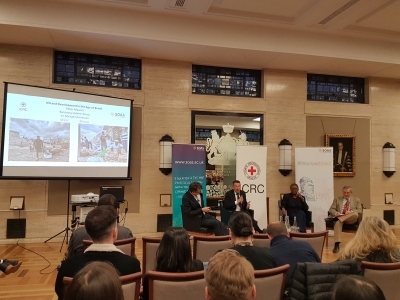 On 5 March 2019, the International Committee of the Red Cross (ICRC) and SOAS hosted a very topical event on Aid and Development in the Age of Brexit. 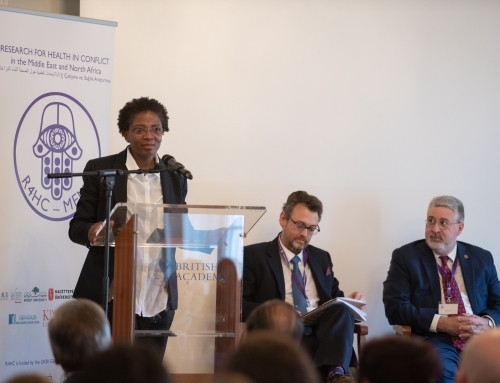 The panel included eminent professionals and leaders in the humanitarian sector; Peter Maurer, President of the ICRC, Baroness Valerie Amos, Director of SOAS, and Sir Michael Aaronson, ex-Chief Executive of Save the Children UK. 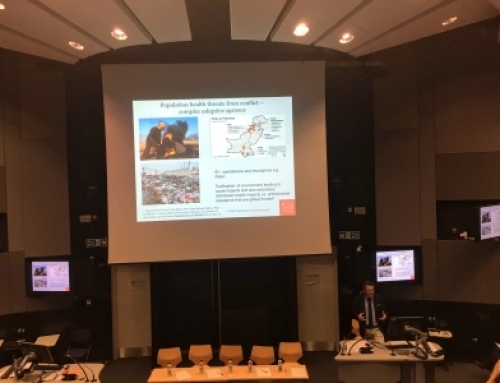 I attended this event as having worked in the Syrian conflict as the head of health response for Save the Children, and now researching health in the conflict and humanitarian sector. 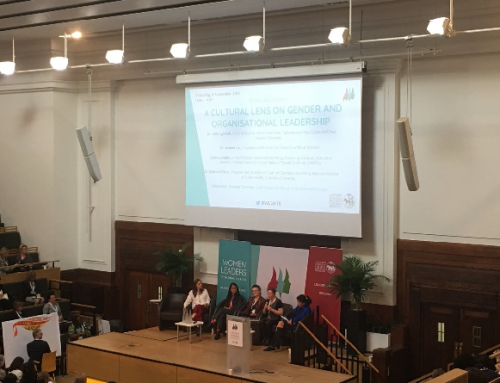 I wanted to learn more about the potential implication of concurrent challenges like Brexit on the humanitarian work; and how leading actors in this sector are approaching these challenges. Peter Maurer spoke about the changing nature of contemporary conflicts; their complexity, urban nature – frontlines no longer consist of two or few sides; in some occasions, ICRC had to deal with more than 35 parties to conflict in only one city. 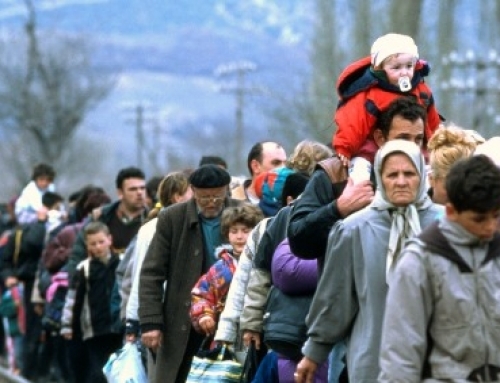 These challenges make engagement for humanitarian actors much more complicated. With this spread of non-state actors, another important factor is the chain of commands for humanitarian actors, which often ends in Washington, London, Paris, Riyadh, Ankara and other capitals. Moreover, there is lack of consistency and cooperation between regional and international powers. 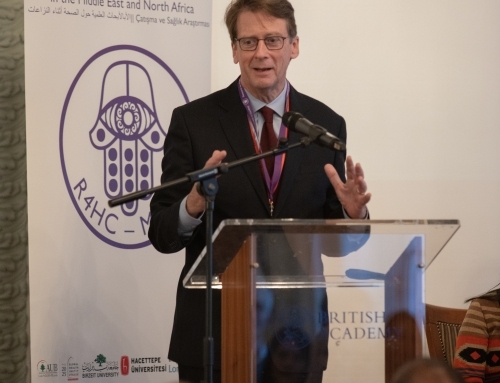 He emphasized the importance of International Humanitarian Law (IHL) and the Geneva Conventions as a framework that is still widely accepted for all humanitarian interventions. Even in cases where some countries or armed groups do not agree with ICRC operations, they tend to accept IHL and the Geneva Conventions in principle. But worryingly, actors that violate IHL, try to justify their actions based on these principles. Yes, there are a lot of violations, however we need also to look at the positive side; more than 140 armies and 200 armed groups in the world have accepted IHL as a binding framework for their operations. Baroness Amos spoke about the politicization of aid as a major challenge facing the humanitarian sector. She gave an example of her work with the UN in Syria where she was trying to negotiate humanitarian access with the government that was using this access as a stake for their political manoeuvring. Also, targeting civilian infrastructure such as hospitals and schools is a clear example of politicizing aid. She also mentioned the enormous pressure on the UN agencies hindering their independence being member-based organisations of states. In these circumstances, Baroness said she cannot be optimistic, especially with having the rise of nationalism, populism and lack of accountability among signatory countries of IHL and other relevant conventions. However, there could be some entry points to influence positive changes that favour humanitarianism. For example, in the UK currently, a lot of voices are calling for global Britain, with little or no idea what comes under this slogan. Her key message was to try to build this narrative to make global Britain an agenda that support good humanitarianism. Michael Aaronson talked about the importance of focusing on developing and maintaining international laws and conventions that govern the humanitarian work, while operationally delivering aid simultaneously. He recalled the work of Eglantyne Jebb, the founder of Save the Children in 1919, when she was responding to children needs but in the same time she was trying to push the global agenda to legalise the child rights. As a result of such efforts, the UN convention on the rights of the child was signed by 194 countries. Also, the Responsibility to Protect (R2P) commitment was endorsed by all member states of UN in 2005 to address issues related to crimes against humanity. He reflected then about the practical reality, where we do not see full respect of these commitments; however, there are still things that can be done. He argues that we have to mobilise civil society to reject some of these problems we are facing in the age of Brexit. More importantly, he brought up the importance of research to tackle these problems. For example, the Global Challenges Research Fund (GCRF) in the UK is a step in the right direction to encourage researchers to come up with practical solutions. It promotes partnerships between academia and other sectors as well as between research communities in the North and the South. Such initiatives are promising as they might provide solutions to some of the largest development and humanitarian challenges.